The Adrenaline Rush® Extreme is the penultimate achievement in the 360 degree modular obstacle course design originally created by HEC Worldwide! This amazing obstacle course has a winding 1850 square foot dual lane maze of interactive features! 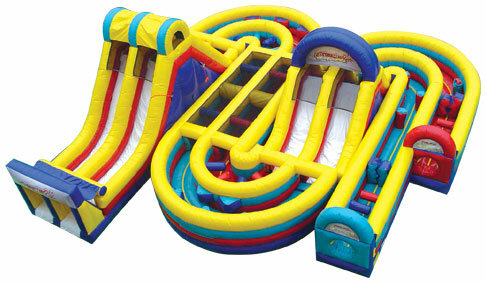 This 3 piece attraction includes a double lane climb and slide, a curved dual lane obstacle track and a double lane slide/obstacle track combo piece! Set up in the original configuration, the course is a full-length race. After bulleting through the pipe entrance of the Adrenaline® Extreme, the riders are immediately challenged with pop outs and squeeze walls obstacles. Midway through this extreme course the riders are met with a rock climb, which once conquered provides a turbo-boosted acceleration down the slide to give you the speed you need to maneuver past even more indomitable pop out and squeeze wall curves. As the riders reach their champion finish they are met with a final mammoth rock climb and final triumphant descent down the exiting slides!